 Mount Shasta, a 14,179-foot (4,322 m) stratovolcano, is the second-highest peak in the Cascade Range and the fifth highest peak in California. It is a member in the Cascade Volcanic Arc and is located in Siskiyou County, and has an estimated volume of 108 cubic miles (450 km), making it the most voluminous stratovolcano of the Cascades. Physically unconnected to any nearby mountain, and rising abruptly from miles of level ground which encircle it, Mount Shasta stands some 10,000 feet (3,000 m) above the surrounding area. 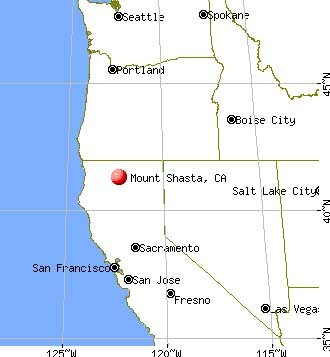 The town of Mount Shasta, at the foot of the mountain, is home to several spiritual groups, some of who regard it as a major grid point on the planet. Its energies are reported to be magnetic as measured by today's technologies. Explanation: Where are all of these meteors coming from? In terms of direction on the sky, the pointed answer is the constellation of Perseus. That is why the meteor shower that peaks later this week is known as the Perseids -- the meteors all appear to came from a radiant toward Perseus. In terms of parent body, though, the sand-sized debris that makes up the Perseids meteors come from Comet Swift-Tuttle. The comet follows a well-defined orbit around our Sun, and the part of the orbit that approaches Earth is superposed in front of the Perseus. Therefore, when Earth crosses this orbit, the radiant point of falling debris appears in Perseus. 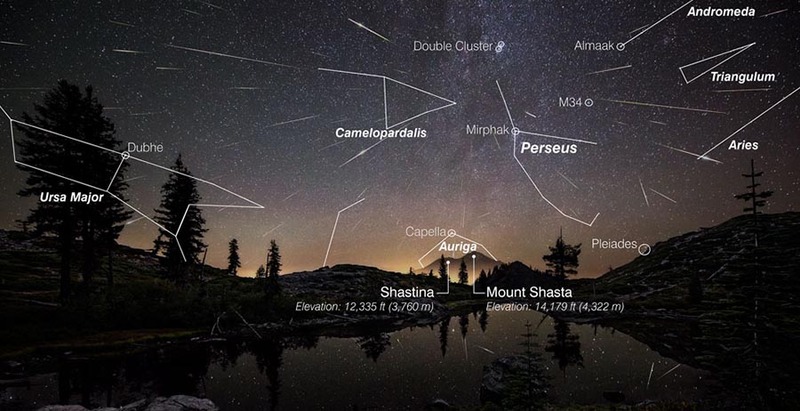 Featured here, a composite image containing over 60 meteors from last August's Pereids meteor shower shows many bright meteors that streaked over Mount Shasta, California, USA. This year's Perseids holds promise to be the best meteor shower of the year. 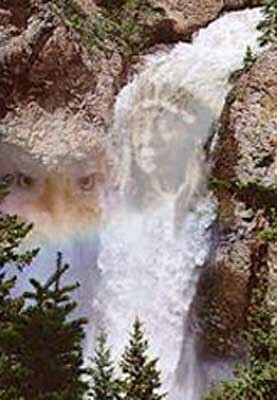 For the Shasta Tribe the mountain was at the center of creation. 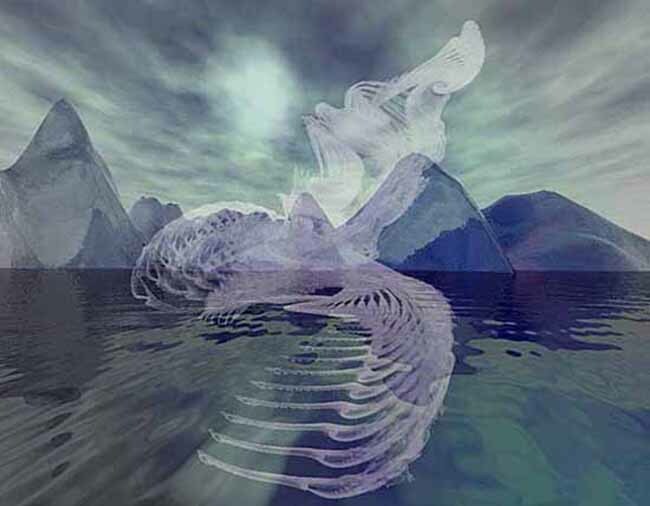 Native American lore holds that Shasta is inhabited by Spirit Chief Skell who descended from heaven to the mountain's summit to create humanity. Many spiritual groups, have been attracted to Shasta, more than any other Cascade volcano. Mt. Shasta, California, a small town near Shasta's western base, is a focal point for many of these religions. Mount Shasta has long been sacred to the Native North American Indians of Northern California. Local tribes practice healing rituals at the springs that flow from the mountain. Other rituals include Sun Dances. 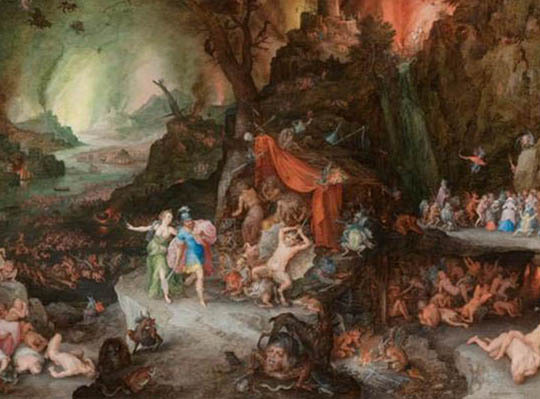 The history of New Age fascination with Mount Shasta can be traced to the publication of Frederick Spencer Oliver's fantasy novel A Dweller On Two Planets. The novel is about the Lemurian race who traveled to Mount Shasta when their continent sank beneath the ocean and are now said to live inside the mountain in a series of tunnels. 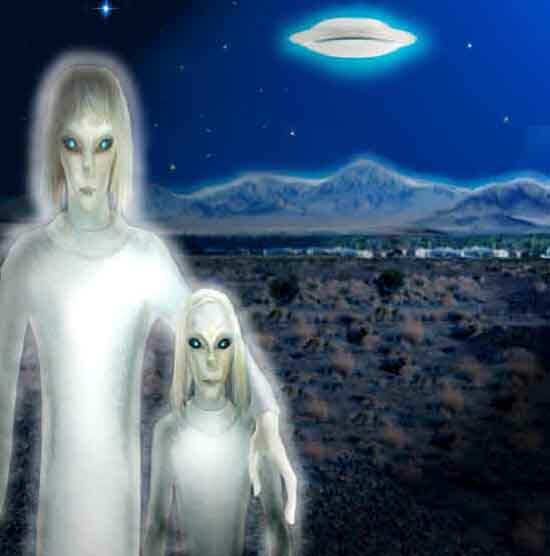 In the years subsequent to the publication of Oliver's book, many seeking people claimed to have encountered Lemurians at Shasta. phenomenon over high places on the earth, which is often mistaken for UFOs. Mt. Shasta is the site of a Buddhist monastery, Shasta Abbey, founded by Houn Jiyu-Kennett in 1971. 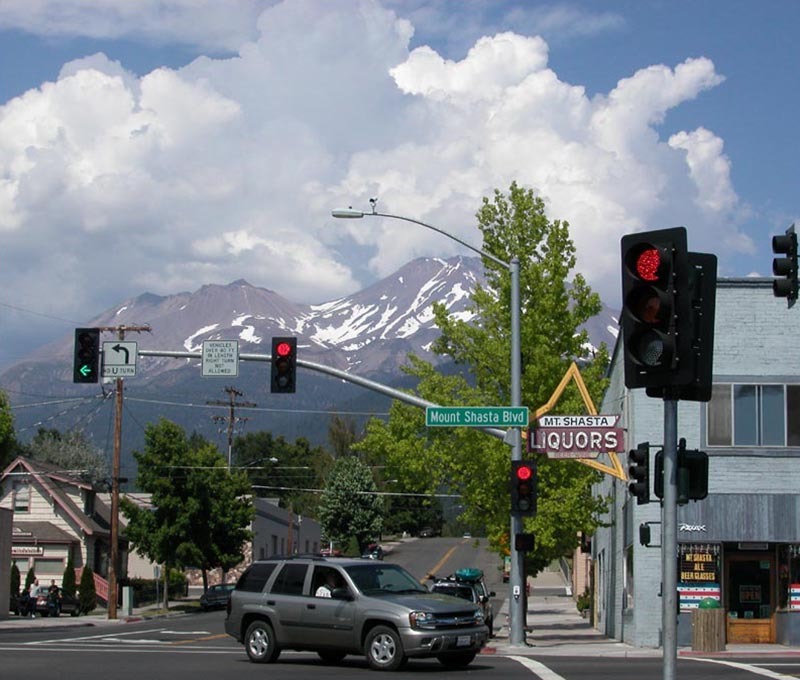 Mount Shasta City hosts 16 Christian churches. If the membership roles are combined, they would account for approximately 25 percent of the population. in honor of Buddha. This corresponds to a festival held in the Himalayas at the same time. The oldest human habitation in the area dates to around 7000 years ago. 5000 years ago there was substantial human habitation in the surrounding area. At the time of Euro-American contact in the 1820s, the Native American tribes who lived within view of Mount Shasta included the Shasta, Okwanuchu, Modoc, Achomawi, Atsugewi, Karuk, Klamath, Wintu, and Yana tribes. Although perhaps first seen by Spanish explorers, the first reliably-reported sighting of Mount Shasta by a Euro-American was by Peter Skene Ogden (a leader of a Hudson's Bay Company trapping brigade) in 1826. In 1827, the name "Sasty" or "Sastise" was given to nearby Mount McLoughlin by Ogden. The name was transferred to present-day Mount Shasta in 1841, as a result of work by the United States Exploring Expedition. Beginning in 1829, Mount Shasta was a prominent landmark along what became known as the Siskiyou Trail, which runs at Mount Shasta's base. The Siskiyou Trail located on the track of an ancient trade and travel route of Native American footpaths between California's Central Valley and the Pacific Northwest. The Siskiyou Trail was widened by later Euro-American use, and was used as the route of today's Interstate 5 and Union Pacific Railroad which run at Mount Shasta's base. The California Gold Rush brought the first Euro-American settlements into the area in the early 1850s, including at Yreka, California and Upper Soda Springs. 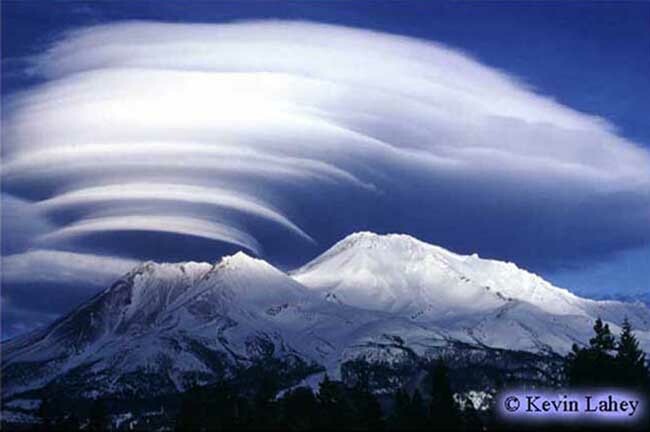 The first recorded ascent of Mount Shasta occurred in 1854, after several earlier failed attempts. The completion of the Central Pacific Railroad line between California and Oregon in 1887 brought an increase in population, tourism and lumbering into the area.Today, the area remains one of California's premiere tourist destinations, attracting travelers from around the world. The mountain consists of four overlapping volcanic cones which have built a complex shape, including the main summit and the prominent satellite cone of 12,330 feet (3,758 m) Shastina which has a visibly conical form. Mount Shasta's surface is relatively free of deep glacial erosion except, paradoxically, for its south side where Sergeants Ridge runs parallel to the U-shaped Avalanche Gulch. This is the largest glacial valley on the volcano, although it does not presently have a glacier in it. There are seven named glaciers on Shasta, with the four largest (Whitney, Bolam, Hotlum, and Wintun) radiating down the from high on the main summit cone to below 10,000 ft (3,000 m) primarily on the north and east sides. The Whitney Glacier is the longest and the Hotlum is the most voluminous glacier in the state of California. Three of the smaller named glaciers occupy cirques near and above 11,000 ft (3,300 m) on the south and southeast sides, including the Watkins, Konwakiton, and Mud Creek Glaciers. There are many buried glacial scars on the mountain which were originally created in recent glacial periods ("ice ages") of the present Wisconsin glaciation. Most have since been filled-in with andesite lava, pyroclastic flows, and talus from lava domes. Shastina, by comparison, has a fully intact summit crater indicating that Shastina developed after the last ice age. About 593,000 years ago andesitic lavas erupted in what is now Mount Shasta's western flank near McBride Spring. Over time an ancestral Shasta stratovolcano was built to large but unknown height; sometime between 300,000 to 360,000 years ago the entire north side of the volcano collapsed, creating an enormous landslide or debris avalanche, 6.5 mile (27 km) in volume. The slide flowed northwestward into Shasta Valley where the Shasta River now cuts through the 28 mile (45 km) long flow. What remains of the oldest of Shasta's four cones is exposed at Sergeants Ridge on the south side of the mountain. Lavas from the Sergeants Ridge vent cover the Everitt Hill shield at Shasta's southern foot. The last lavas to erupt from the vent were hornblende-pyroxene andesites with a hornblende dacite dome at its summit. Glacial erosion has since modified its shape. The next cone to form is exposed south of Shasta's current summit and is called Misery Hill. It was formed 15,000 to 20,000 years ago from pyroxene andesite flows and has since been intruded by a hornblende dacite dome. Since then the Shastina cone has been built by mostly pyroxene andesite lava flows. Some 9,500 years ago, these flows reached about 6.8 miles (11 km) south and three miles north of the area now occupied by nearby Black Butte. The last eruptions formed Shastina's present summit about a hundred years later. But before that, Shastina, along with the then forming Black Butte dacite plug dome complex to the west, created numerous pyroclastic flows that covered 43 mile (110 km), including large parts of what is now Mt. Shasta, California and Weed, California. Diller Canyon (400 ft (120 m) deep and quarter-mile (400 m) wide) is an avalanche chute that was probably carved into Shastina's western face by these flows. The last to form, and the highest cone, the Hotlum Cone, formed about 8,000 years ago. It is named after the Hotlum glacier on its northern face; its longest lava flow, the 500 ft (150 m) thick Military Pass flow, extends 5.5 miles (9 km) down its northwest face. Since the creation of the Hotlum Cone, a dacite dome intruded the cone and now forms the summit. The rock at the 600 ft (180 m) wide summit crater has been extensively hydrothermally altered by sulfurous hot springs and fumaroles there (only a few examples still remain). In the last 8,000 years, the Hotlum Cone has erupted at least eight or nine times. About 200 years ago the last significant Shasta eruption came from this cone and created a pyroclastic flow, a hot lahar (mudflow), and three cold lahars, which streamed 7.5 miles (12 km) down Shasta's east flank via Ash Creek. A separate hot lahar went 12 miles (19 km) down Mud Creek. This eruption was observed by the explorer La Perouse, from his ship off the California coast, in 1786. During the last 10,000 years Shasta has erupted an average of every 800 years but in the past 4500 years the volcano has erupted an average of every 600 years. The last significant eruption on Shasta may have occurred 200 years ago.Mount Shasta can release volcanic ash, pyroclastic flows or dacite and andesite lava. Its deposits can be detected under two nearby small towns totaling 20,000 in population. Shasta has an explosive, eruptive history. There are fumaroles on the mountain, which show that Shasta is still alive. The worst case scenario for an eruption is a large pyroclastic flow, such as what occurred in the 1980 eruption of Mount St. Helens. Since there is ice, lahars would also result. Ash would probably blow inland, perhaps as far as eastern Nevada. There is a small chance that an eruption could also be bigger resulting in a collapse of the mountain, as happened at Mount Mazama in Oregon, but this is of much lower probability. 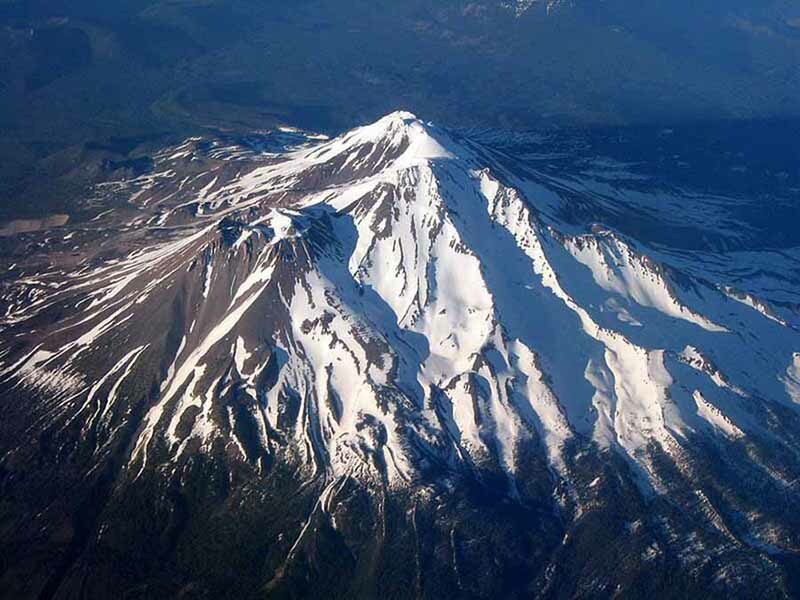 The US Geologic Survey considers Shasta a volcano with a high probability of erupting again. Mount Shasta sees many climbers annually attempt to make it to the summit. The summer climbing season runs from late April until October, although many attempts are made in the winter. The most popular route is Avalanche Gulch, also known as the John Muir Route. It begins at a Sierra Club cabin known as Horse Camp, at elevation 7,900 ft (2,400 m) on the southwest side of the mountain, near tree line. It involves 6,300 ft (1,900 m) of vertical gain over moraines and snowfields, with some danger from rockfall and a bergschrund. Because Mount Shasta is a very popular mountain for climbers in the summertime, it sees many inexperienced climbers who become in need of rescue. Hiking trails also exist in areas around the base of the mountain. In winter, Sargent's Ridge and Casaval Ridge, to the east and west of Avalanche Gulch respectively, become the most traveled routes, to avoid avalanche danger. Mount Shasta is also a popular destination for backcountry skiing. Many of the climbing routes can be descended by experienced skiers, and there are numerous lower-angled areas around the base of the mountain. Along the way, an albino man with large dark glass walked past me near one of the snow covered areas of the mountain. I didn't think anything of it until I drove down the mountain headed back to town and saw the same man waking towards me on the road. No way could he have driven down the mountain as there were no other cars around at that time. The funny thing was when I passed him in my car, I felt him telepathically telling me that he was guiding my trip. Later I bought a "Lemurian seed crystal" to bring back to my apartment in Hoboken, NJ. You may remember me showing it to you when next we met. Thanks Robert. Your description of the albino in dark glasses sounds a lot like the grays. UFOs are often reported and photographed coming in and out of volcanic mountains, highlighted in Mexico City with Mount Popocatepetl. Some believe Mount Shasta is an entry point to another dimension and allegedly the home of the mythological underground city Telos. 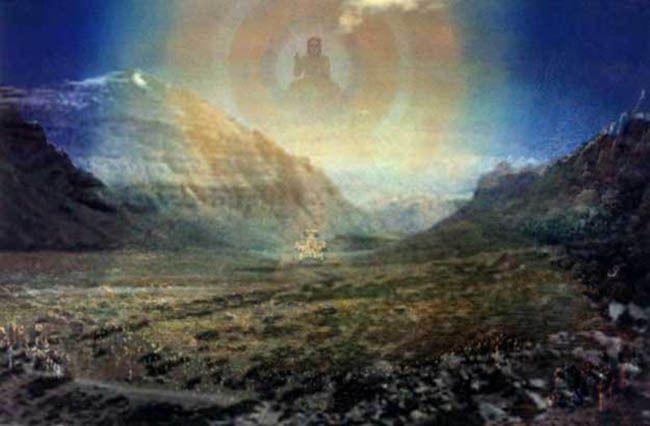 Engineer Guy Ballard claims to have met ascended master St. Germain on its slopes in 1930.